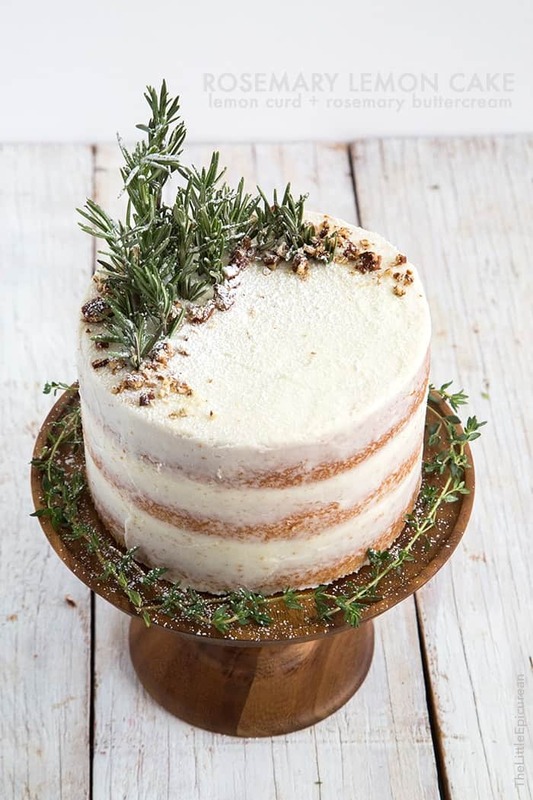 This Rosemary Lemon Cake has three layers of lemon cake filled with lemon curd, coated with rosemary infused buttercream, and topped with candied pecans. I really can’t thank Alex enough for all he does for me. These have been the most stressful, trying, and emotional weeks I have ever endured. Yet, throughout this time, Alex has been so thoughtful, accommodating, and extremely comforting. He dries my tears, brings me dinner, and he lets me watch all my favorite movies (The Notebook, The Parent Trap, My Best Friend’s Wedding, 13 going on 30, etc) without any complaints or snarky comments. One can only say thank you so many times until it begins to lose meaning. That’s when cake comes in. 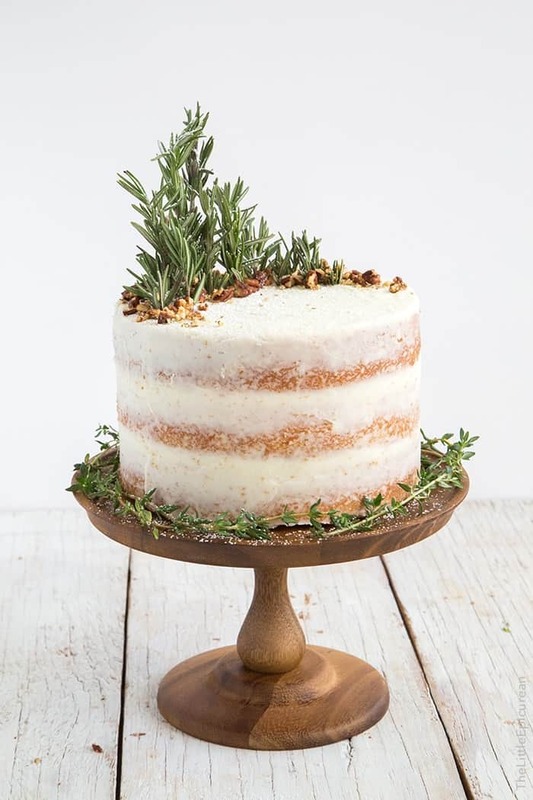 Three layers of lemon cake filled with lemon curd and rosemary buttercream. Alex loves, loves, LOVES lemon desserts. Think lemon meringue pie, lemon bars, lemon ricotta pancakes. I, on the other hand, prefer lemon in savory applications like rosemary lemon roasted chicken or grilled lemon herb pork chops. Since relationships are built on compromise, I’m learning to tolerate lemon desserts for Alex. I normally won’t touch lemon curd, but I added it in this cake just for him. This recipe makes three 6-inch lemon cake rounds. The cake is flavored with lemon juice and lemon zest, absolutely no lemon extract or any fake lemon stuff. The buttercream is made with rosemary infused butter. Melted a cup of unsalted butter with three rosemary sprigs. Allow the mixture to steep for about an hour or so, until the butter cooled to room temperature. Finally, strain out the rosemary and seasoned the butter with quite a bit of salt. To assemble the cake, start with one lemon cake round. Spread a very thin layer of rosemary buttercream on top of the cake. Then pipe a small border of rosemary buttercream along the perimeter of the cake round. This will serve as a barrier when you filled the cake with lemon curd. Carefully spread a layer of lemon curd within the buttercream boundaries. Do this for the first two layers of the cake. The final (third) top layer will not have lemon curd. 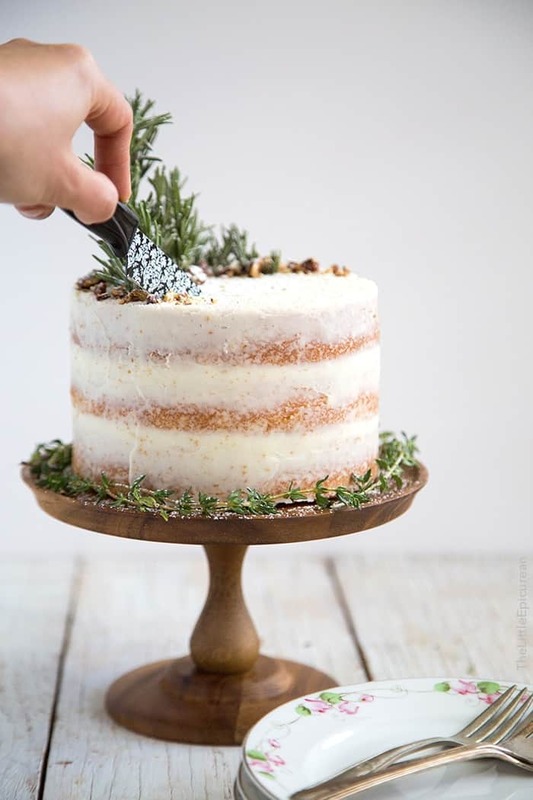 Once the cake has been filled, frost the outside of the cake with the remaining rosemary buttercream. 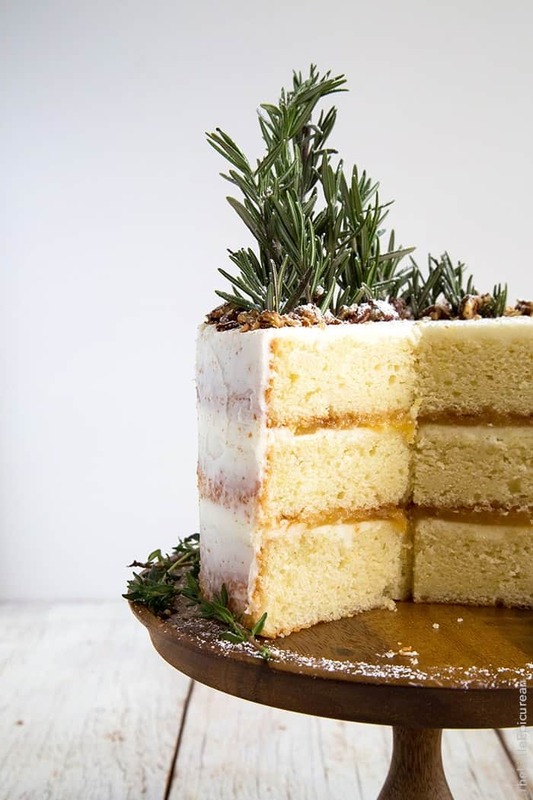 If you decide to lightly coat the cake (like shown above), you will have plenty of leftover rosemary buttercream to use in other baking adventures. I decorated the finished lemon cake with fresh sprigs of rosemary (to resemble pine trees) and crumbled candied pecans (to mimic soil). And since it’s the holidays, I dusted some powdered sugar on top for a lovely “snow” effect. 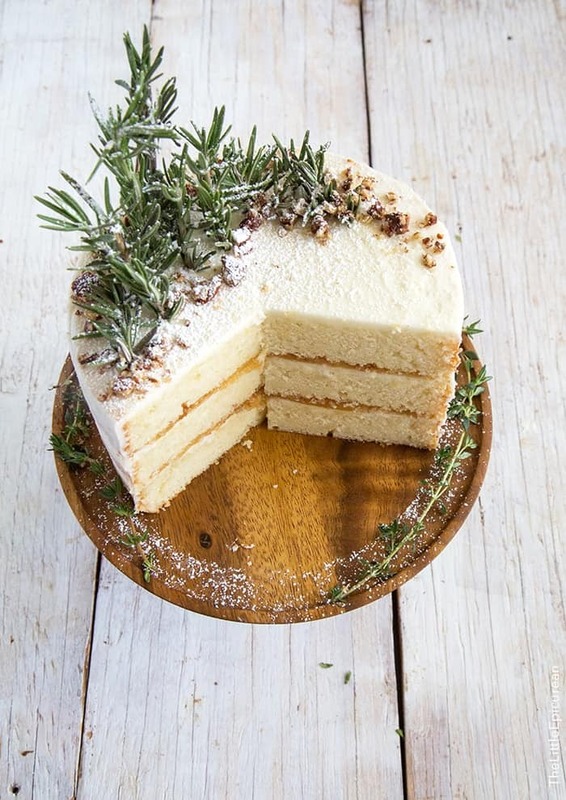 The base of the rosemary lemon cake is adorned with lemon thyme. Although I didn’t use lemon thyme in the recipe, I thought it added a nice earthy feel to the cake. I dread cutting into the cake. You spend so much time making it pretty, only to destroy it. But once you slice into it, you see all the beautiful and delicious layers hidden inside. I’m proud to say that I’m honestly starting to enjoy lemon desserts. The use of lemon juice and lemon zest in the batter produces a very fresh tasting cake. And the rosemary buttercream is now one of my absolute favorites. It’s sweet-savory pairing that works really well together. Preheat oven to 350 degrees F. Line three 6-inch cake round pans with parchment paper. Lightly grease and set aside. In the bowl of a stand mixer fitted with a paddle attachment, cream butter. Add sugar and whip until smooth. Add eggs and continue to mix on medium speed until incorporated. Incorporate sour cream and mix. Scrape down bowl as needed to ensure thorough mixing. Divide batter evenly among the three prepared cake pans. Level batter using a mini offset spatula, or the back of spoon. Bake for 35-40 minutes until a toothpick inserted in center of cake comes out clean. Let cake cool in pan for 5 minutes, then run a mini offset spatula around the cake and unmold. Let cake cool to room temperature on wire rack. In a heavy bottomed sauce pot, add butter and rosemary. Melt over medium high heat and bring to a boil. Allow to boil for 1 minutes. Remove from heat and allow to cool. Allow rosemary to steep for 60-90 minutes until butter is cool to the touch. Strain out rosemary and keep butter chilled in the fridge until ready to use. Let chilled rosemary infused butter soften at room temperature before use. Using a hand held mixer or a stand mixer fitted with a paddle attachment, cream butter. Add confectioners' sugar, salt, and cream. Mix until buttercream is smooth. If buttercream is too soft, add additional confectioners' sugar 1 Tbsp at a time until desired consistency is achieved. If necessary, level cake layers. Place one cake round on a cake turntable. 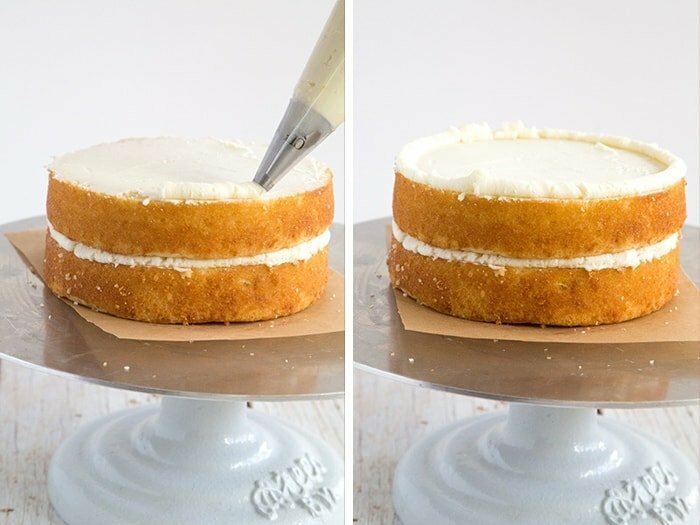 Spread a thin layer of buttercream on cake using a small offset spatula. Using the filled piping bag, pipe a small border of rosemary buttercream along the perimeter of the cake round. This will serve as a barrier when you filled the cake with lemon curd. Spread buttercream around the cake to create a "crumb coat" layer to seal in any crumbs. Chill cake in the fridge for 15-20 minutes to set frosting. If desired, generously coat the chilled cake with additional buttercream. Chill cake if not serving immediately. Decorate cake with fresh rosemary sprigs and crushed candied pecans. Dust top of the cake with sifted powdered sugar. Let cake sit at room temperature for at least 30 minutes before serving to allow cake to soften. Remember my obsession with plates? Here’s another one from my growing collection. These delicate, hand-painted plates were made in England. They belonged to my great-grandmother. She received it as a wedding gift in 1896 (meaning these plates are over 100 years old!) My mom brought them back from the Philippines a few years ago. I have treasured them ever since. Wow! What a stunning cake Maryanne!! Sounds totally delicious!! it’s great you’re stepping outside your comfort zone with lemon desserts (; they’re so tasty! would have never thought to pair rosemary and lemon on dessert (definitely on a chicken, though), but it sounds really refreshing in terms of both taste and originality! Thanks Heather! :) Herbs in sweet baked goods is surprisingly really tasty! Your cake is stunning…I just love your pictures! I like lemon for sweet or savory. I never would have thought to combine lemon and rosemary on a dessert, but it looks wonderful! Hi Maryanne ,your cake is great. I would love you to stop by Food on Friday: Cakes over at Carole’s Chatter to add this to the cake collection! Cheers! This is lovely, Maryanne! Rosemary and lemon go so well together, and it looks so yummy! I love lemon desserts, and the herbs in here are so enticing. Plus, it’s absolutely gorgeous! 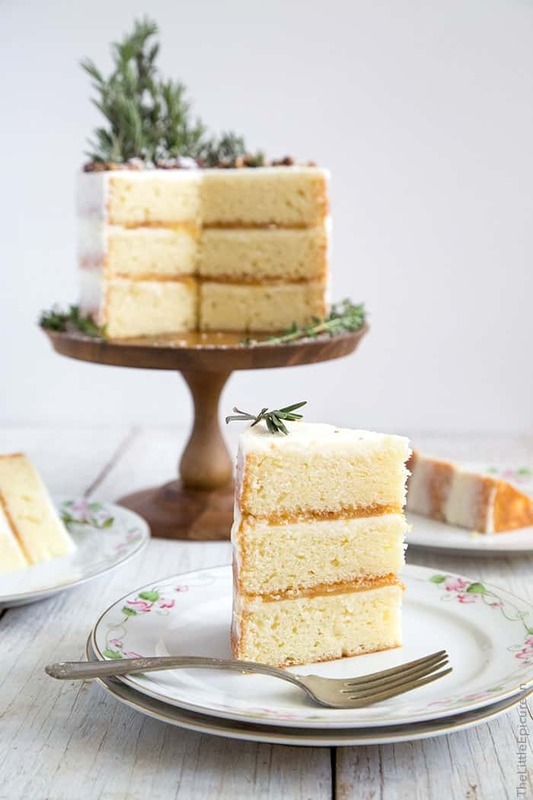 This cake is pure gorgeousness and I LOVE the lemon-rosemary combo! You’re too kind! Thank you Kimberly! This cake is stunning!! Not only does it look gorgeous, but the flavor combination sounds incredible. This would be perfect for the Thanksgiving table. OH MY GOSH. Lemon is my favorite and mixed with rosemary??? Be still my heart! I have been waiting for this one and it didn’t disappoint. You blow me away every time lady! I love those movies too! And I love this cake! It is seriously gorgeous. (hehe movie night!!) Thanks Michelle! Wow, what a work of art. The flavors are awesome. I only wish I could have a piece of this glorious cake! I made this cake today to celebrate a late birthday with my family for my twin sister and I! We always celebrate when we visit home over Thanksgiving because we both live in different cities now. The cake was perfect! I used two 8-inch cake pans instead of three 6-inch because it is what my Mom has at her house. I shortened the baking time to 26 minutes and the layers came out beautifully! The rosemary in the buttercream was the perfect complement to the lemon cake and lemon curd filling. I will definitely make it again, and I’m dreaming of all the ways I could use rosemary buttercream now. Made your cake it was delicious. I was just wondering how many people this cake fed and how easily it would be to adapt the recipe for 3 x 9″ pan. Cake serves 10-12 people. If you use 9″ cake pan, you will need to reduce the baking time. can we substitute yogurt or greek yogurt for the sour cream?? Yes, greek yogurt could be substituted for the sour cream. How far in advance can you make this beautiful cake? My son was born on Christmas day, and I have been trying to think of a fun birthday cake for this first birthday coming up in a few months. Something season appropriate, completely delicious, and totally picture worthy — I think I’ve found it! What a gorgeous cake. And I LOVE the naked cake effect with the extra-thin layer of frosting. I’m thinking of doing this for the adults, and a mini version with fun-fetti for my little Mr. Thank you, Kaylee! I’m glad you found it! Love the idea of adding funfetti to make it more festive for your son’s bday! I love lemony sweets and cakes and the mix of rosemary sounds incredible. And it’s such a beautiful cake – perfect for fall/winter. 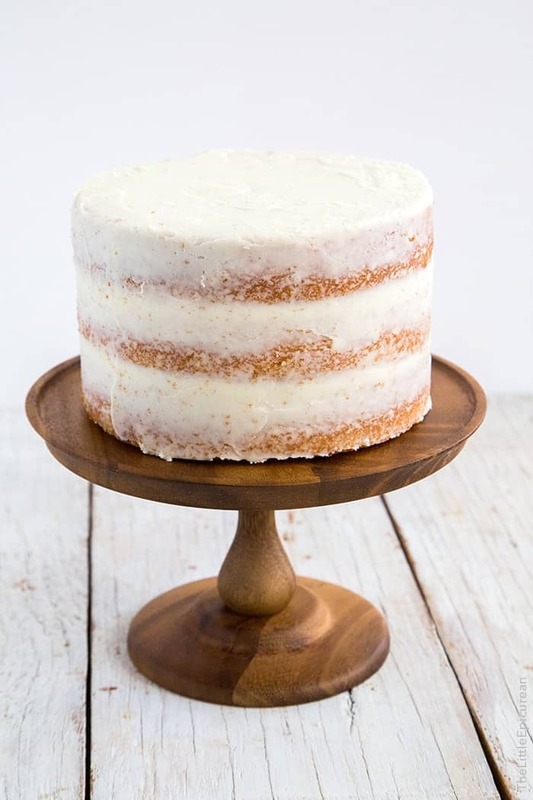 This cake was a huge success at my wedding and I am so glad you created this recipe. I am making cupcake versions of it for Christmas. I cannot get enough of it. Happy belated birthday! I’m so glad you enjoyed it! Thank you for trying out the recipe! 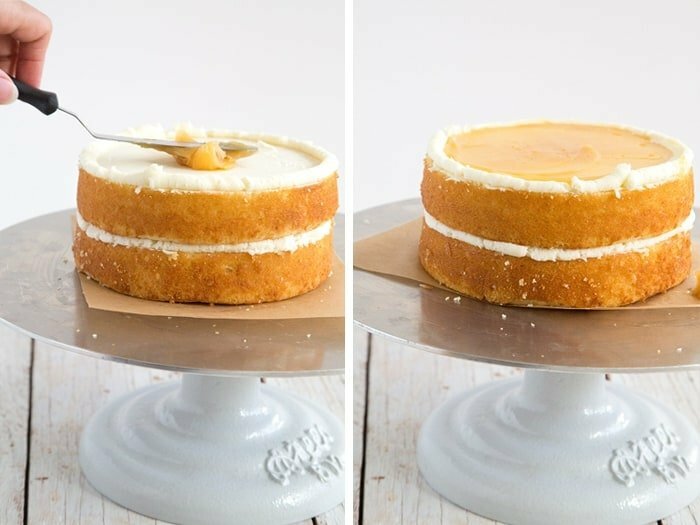 I have been looking for a lemon cake with lemon curd, this recipe seems to be what I’m looking for! I want to try and make it. Do you have measurements in grams? Also, can all purpose flour be replaced with cake flour ? Unfortunately, I do not have the gram measurements for this recipe. No, APF cannot be replaced with cake flour in this recipe. APF will result in a denser cake. This looks so yummy! What part of this cake requires it to be refrigerated? Is it the curd? Sorry for the silly question, but I am fairly new to baking something like this. I love trying new things and this looks absolutely wonderful! Yes, because of the lemon curd, I suggest keeping any leftover cake chilled in the fridge. During the assembly portion, the frosted cake is chilled to allow the buttercream to harden and bring structure to the cake. Made it for a training luncheon and everyone loved it…. They really enjoyed it’s unique fresh flavor. I also made one for my Son-In-Laws Birthday. I really didn’t know if my husband would like it and he acted hesitant and ended up having 2 pieces…. Success !!!! Thank you for trying out the recipe! I’m so happy to hear everyone enjoyed it! Hi Alicia! Unfortunately, I am not well versed in vegan baking. I have only tested this recipe as written. I’m wondering how I can tweak this recipe to work w 9” cake rounds. I looked for 6” at the store and they didn’t have any. I’m also hoping to serve this at a larger gathering so a bigger cake is probably better. I had this cake once about 2-3 yes ago and I have thought about it every since. I can’t wait to make it for myself.